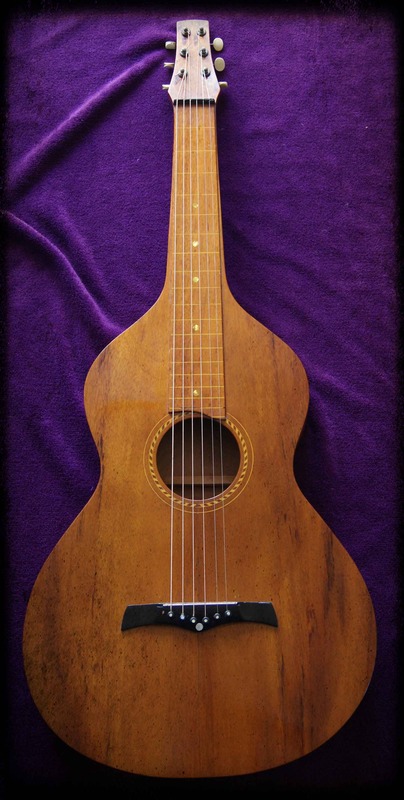 Beautiful & extremely rare pre-1920's lap steel guitar built by Mr. Hermann Weissenborn. This Weissenborn was a mystery for us a long time. 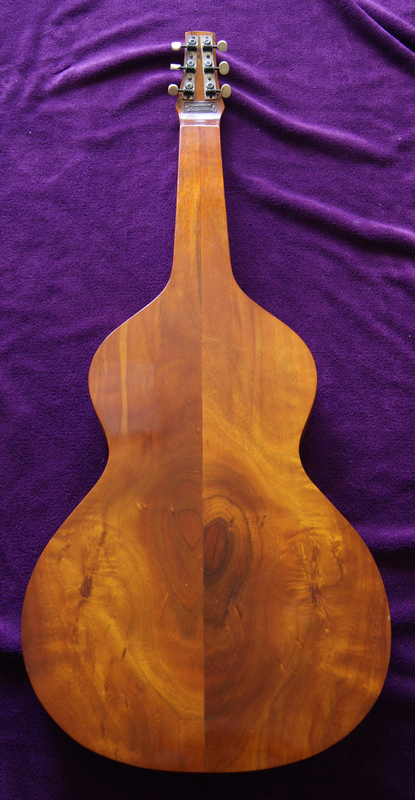 It has a Rope Binding around Soundhole indicating it is a Weissenborn Style 2. But no Black Binding to fullfill the rest of the Style 2's characteristic details. So we did not know what kind of Weissenborn Style this one is and what years it has been built. There is a metal shield which shows that it must have been sold in C.W. 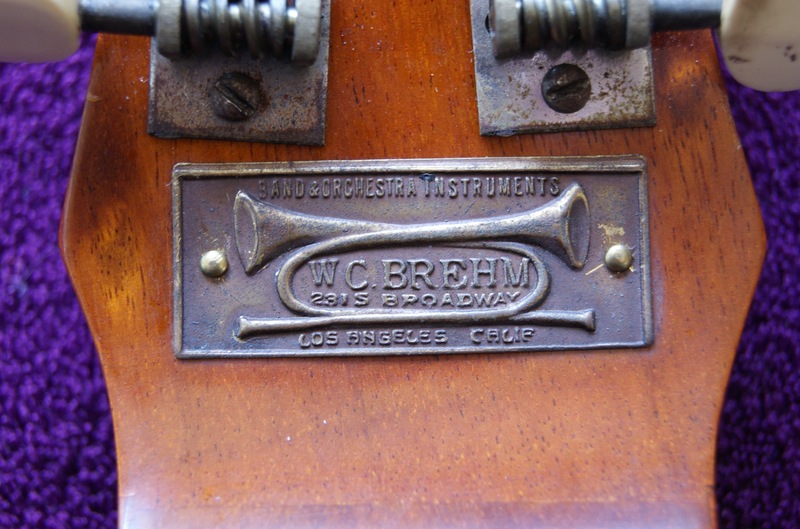 Brehm's musical instruments store located in Los Angeles around 1925 - but that's it. There was also no burned in brand in the Weissenborn. So we had not a single clue what kind of a Weiss we have here. Not until Mr Tom Noe, writer of the wonderful book 'From Harp Guitars to the New Hawaiian Family: Chris J. Knutsen', helped us with his marvellous knowledge about Weissenborn guitars. Thanks for your friendly help & your kind permission to quotate you here, Tom! 'Your Weissenborn is an unusual hybrid of Styles 1 and 2. Basically a Style 2 without the black binding. Note the "points" on the headstock hips, These indicate a rather early pre-production instrument, pre-1920. The bridge is similar to those used in the 1920-22 era, but appears slightly longer, note the convex line across the top edge. I think the back is part of the original guitar and hasn't been replaced. There is no burned in brand because the guitar was built before the factory was established! It appears to me that HW intended a paper label for this one. I have seen another Weissenborn like this one from the early pre-1920 days. As you know, Weissenborn's earliest guitars were mostly with Style 2 appointments, with some Style 1s thrown in. 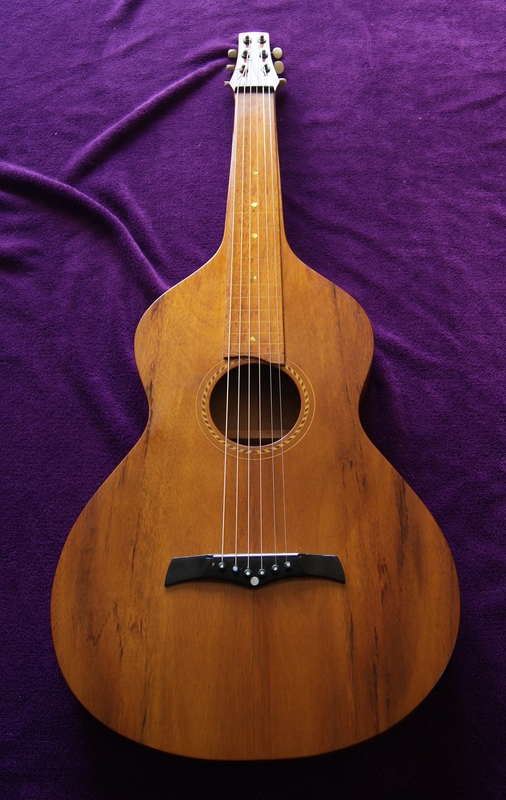 Pre-production Weissenborns with rope bindings are extremely rare, and appeared mostly the solid-necks. The earliest date for the Brehm plate would have been late1925, amd so to me it was a used instrument when Brehm had it. So here we have an absolute rare vintage-instrument in near mint condition. Reasonable price offers are welcome!